The music legends were making plans to record together in the year before Jimi's sudden death in 1970, along with jazz star Tony Williams, and an old telegram has revealed they were also hoping to recruit the Beatles star to play with them. The telegram Jimi sent to the star at The Beatles' Apple Records in London on October 21, 1969 - which contains typographical errors - reads: "We are recording and LP together this weekend in NewYork. How about coming in to play bass stop call Alvan Douglas 212-5812212. Peace Jimi Hendrix Miles Davis Tony Williams." Hard Rock historian Jeff Nolan said: "It's not something you hear about a lot. Major Hendrix connoisseurs are aware of it. It would have been one of the most insane supergroups. These four cats certainly reinvented their instruments and the way they're perceived." The telegram advises Sir Paul to contact producer Alan Douglas (whose first name is misspelled in the cable) if he could make the session. But it's not clear if the star was even aware of the apparently impromptu invitation to rush from his London base to New York to take part. Beatle aide Peter Brown replied on his behalf, telling Jimi the following day that the star was on vacation and not expected back for another two weeks. 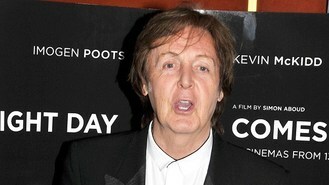 The former Beatle is the only one of the four musicians who is still alive. His spokesman, Stuart Bell, said the star was too busy on his world tour to comb his memory for his thoughts about a telegram sent more than four decades ago. Jimi's death dashed their plans to record together, with or without Sir Paul. Eddie Kramer, the engineer who produced most of Jimi's music, said there will always be speculation about what might have been. "I think it would have been phenomenal," he said. "Lord knows where it may have gone; those huge egos in the studio at the same time! I would have loved to have done that one. But it was not to be."